Enough power to keep you going for days. Charge an iPhone 8 almost 5 times, an iPhone X or Samsung Galaxy S8 3 times or an iPad Air 2 once. Surge protection, short circuit prevention, and more advanced safety features keep you and your devices safe. Use the included Micro-USB cable, your original cable or a third-party certified one (such as MFi); AC adapter not included. Please use your original Apple charging cable (not included) to charge Apple products. 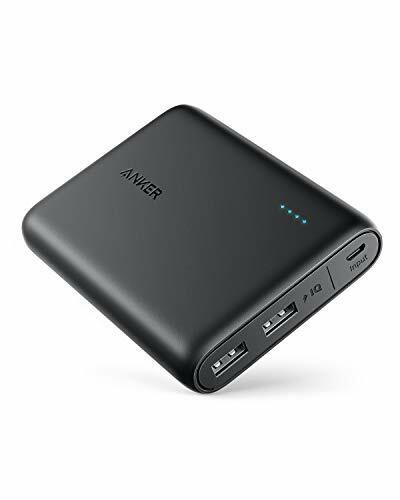 Compatible with most USB-charged devices, including iPhone 8 / X / XS / XS Max / XR (Lightning cable required), Android smartphones and tablets (including the Nexus 7), USB-C MacBooks / iPad (USB A to C cable required). Not compatible with the iPod nano, iPod Classic; Not for devices with an input below 50mA (e.g. some Bluetooth headsets and GPS devices).